Windsurfing’s early inventors began in 1948 with some of the first designs, but were not produced and patented until later 1960’s. 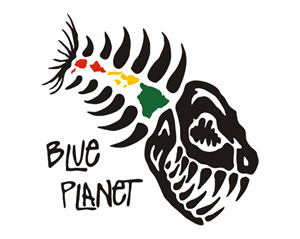 Evolution of the sport largely took place here in the Hawaiian islands and over the years many windsurfing enthusiasts migrated from Oahu to Maui for the stronger more consistent winds. Kailua was one the early epicenters for windsurfing and the proving grounds for many of the top professionals like Kailua natives Pete Cabrinha, Robby Naish and Josh Stone. 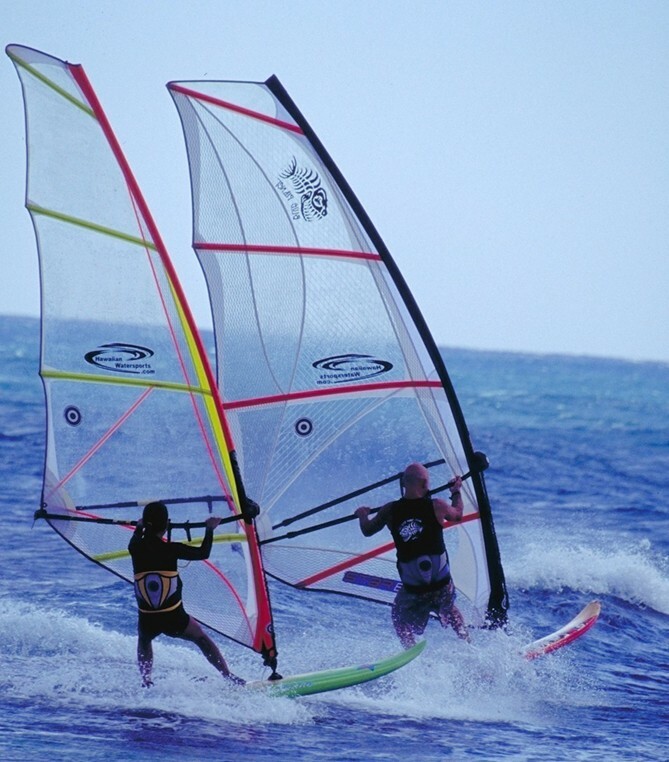 The sport developed into three disciplines of Course Racing, Downwind Slalom racing and Wave riding/ jumping that each required different specific gear. The latest craze is Hydrofoil windsurfing that help riders eliminate chop and glide efficiently over the water with smaller sails and quiet speed. 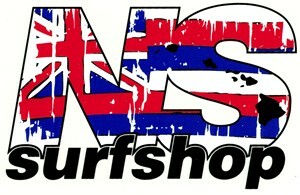 This new style of windsurfing ride is perfect for Kailua and available from pioneer company Slingshot. The water inside Kailua Bay is warm and relatively shallow at ~10ft deep and the wind blows side onshore in the North Easterly direction (trade winds) most days at 10-15 mph. 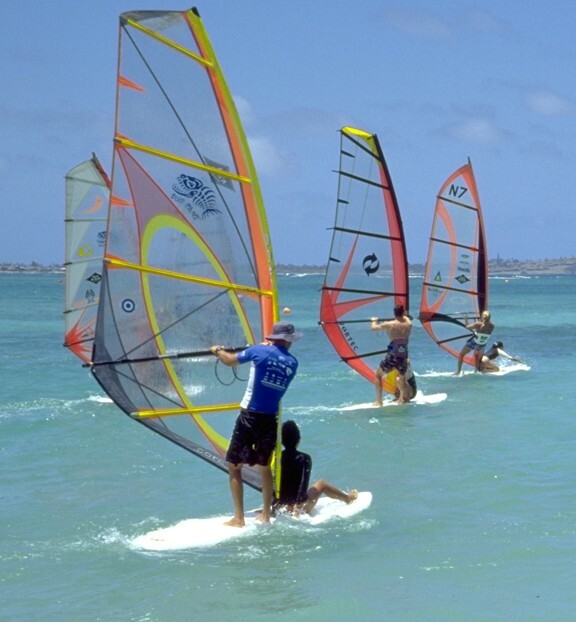 So that means you can always make it back to shore easily with the wind pushing you which makes Kailua a great place for all levels of windsurfers. 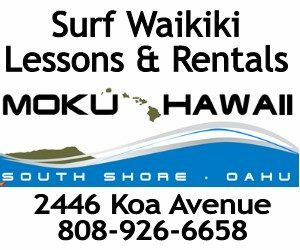 Windsurfing is also possible at other select spots on Oahu for advanced riders can be seen on windy days at Diamond Head & Mokuleia beach parks. Windsurfing is a challenge and requires some determination to pass the learning curve. That said, taking lessons is highly recommended to speed that learning curve and keep progress rolling forward. 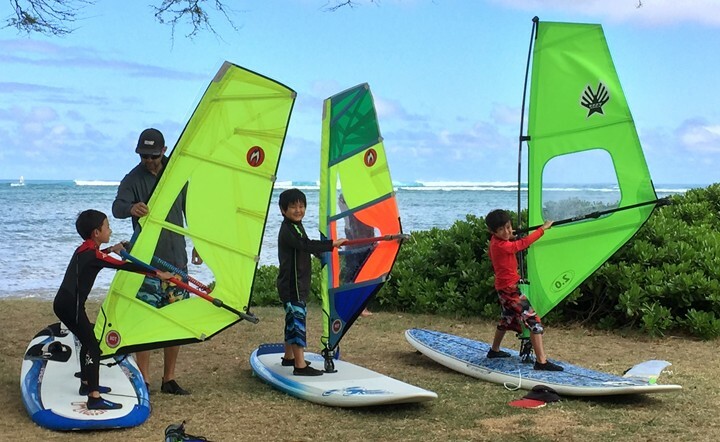 Small Sails and large wide boards are the best way to learn in lighter winds. 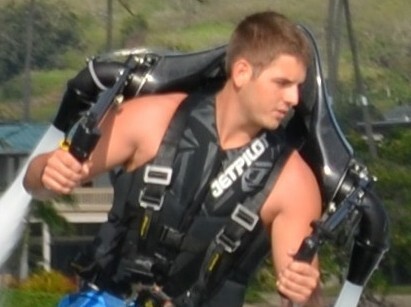 Then larger sails and a harness work great once you get comfortable. 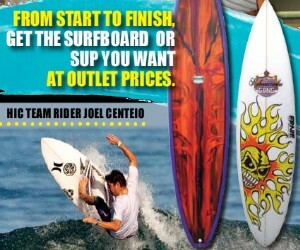 Finally the smaller board combined with higher winds takes performance windsurfing to amazing maneuvers and speed runs. After taking lessons, the correct rigging of your sail and equipment is really important, so you want to buy quality compatible parts that fit your body weight and skill level for the best result. Used gear can be found but watch out for the old parts that can break right away. Brands that have stood the test of time with quality products are Starboard, JP Australia, Neil Pryde, Chinook, Ezzy and Hot Sails. Beginners should work with good instructors and a reputable retail outlet to ensure the best gear for your needs.